Summer was drawing to a close but in a few weeks there would be chores to do on the Catskill Mountain estate I had come across in 1969. There was a little time to go exploring and for no reason except having heard Old Cape Cod several thousand times on juke boxes and radios during my life I decided to get out my thumb and head across Massachusetts. Avoiding freeways and towns as best I could, and conscious of being in the Catskill Mountains, I followed the little black lines on a map to the town of Catskill, on the Hudson River. It must have been a pretty easy journey for I remember nothing of it! Nor do I remember much of Catskill the town. In fact I probably skirted the town itself, coming in on New York State Highway 23A and approaching the Rip Van Winkle Bridge on the east side of town. What an unexpected treat! Built in 1935, the Rip Van Winkle Bridge is an impressive structure. After miles of forests and fields this mighty steel cantilever bridge jumps the mighty Hudson River some 120 miles from the river’s mouth at New York City. The bridge has ship clearance of 145 feet, a full 14-story building, above the water. Of course, ship clearance is not as far above the water as the bridge is. On seeing the bridge I found myself calculating how to get across it. I wanted to walk across to check out the Hudson River, but I’d been on many of these narrow cantilever bridges in my day. I couldn’t imagine getting over nearly a mile of such an enclosed structure while dodging cars by squeezing on the side of the decking. Matters worsened when I got close enough to realize the bridge was a toll bridge, meaning booths with officials that would surely report a backpacker taking off on foot in front of traffic. But then my heart sang. I got close enough to discover this mighty structure, built to let wheels roll over water, included a walkway — an isolated path all on its own, running on the outside of the superstructure that held the road. My heart was even happier to discover the toll for walking was free! First was how far above the river the bridge is. It crosses from above the bluffs beside the river, not over the river itself. Second is how big the Hudson River is! Wow. And, third, how green the Hudson Rover Valley is. Rivers are green in the desert West, but only along a few feet of their banks. Here all was lush. My greatest fascination while walking across the Rip Van Winkle Bridge I’ll get to in my next blog. 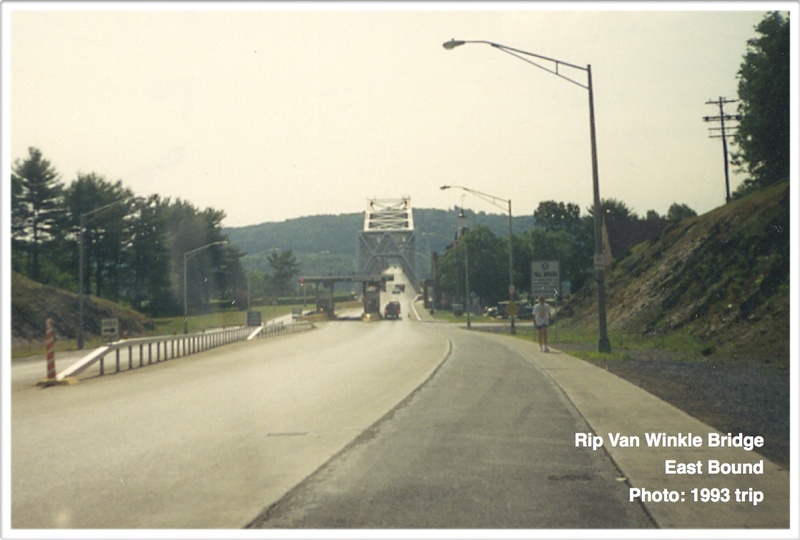 This entry was posted in Hitchhiking and tagged bridge, Catskill Village, hitch hiking, Hudson River, Hudson town, Rip Van Winkle Bridge on March 30, 2015 by deansgreatwahoo. How knew? Learning a thing or two every day. Thanks Dean. You took me there. Who knew? Learning a thing or two every day. Thanks Dean. You took me there.